Successful automation requires the design of a flexible system to integrate and network different controls. The enormous variety of programming software, different user interfaces and functionality can increase human error. 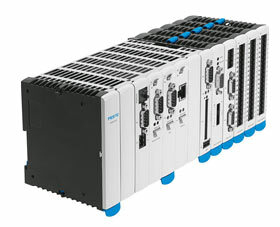 Festo trains in Programmable Logic Controllers (PLCs). We can introduce your maintenance technicians and engineers to PLCs and improve their fault finding skills. Courses include an introduction to PLC controlled systems, ensuring that your people are familiar with the equipment and terminology, as well as equipping them with the skills to write and implement simple programmes. We take our training further with Programming skills and have recently introduced CoDeSys Fundamentals for PLC Programmers. We also run training courses specifically on Siemens, Mitsubishi and Allen Bradley PLC technology. As well as our open PLC training courses held in Northampton, we can also tailor our course to your needs. Your employees can be trained in-house or at Festo’s national training centre in Northampton.